There are rumors swirling around that Conor McGregor was going to be booked to fight in the UFC again on December 30th, however those plans have been put on hold after his recent altercation with referee Marc Goddard, when Conor stormed the cage and shoved the ref for doing his job. On the one hand, it’s surprising that the UFC would put such a massive fight on hold, but on the other hand it’s not the first time they’ve taken action to reign-in Conor when the young superstar has gotten out of control. He’s been cut from a card before, after refusing to do his media obligation on the UFC’s terms. Also, it seems like the UFC likes to put him in check and flex their power sometimes when Conor starts talking too big, like recent talks that Conor wants to co-promote with the UFC moving forward, an unprecidented move for a UFC fighter. The other time a big name fighter wanted to co-promote was Fedor, and it’s the reason we never saw him in the UFC. 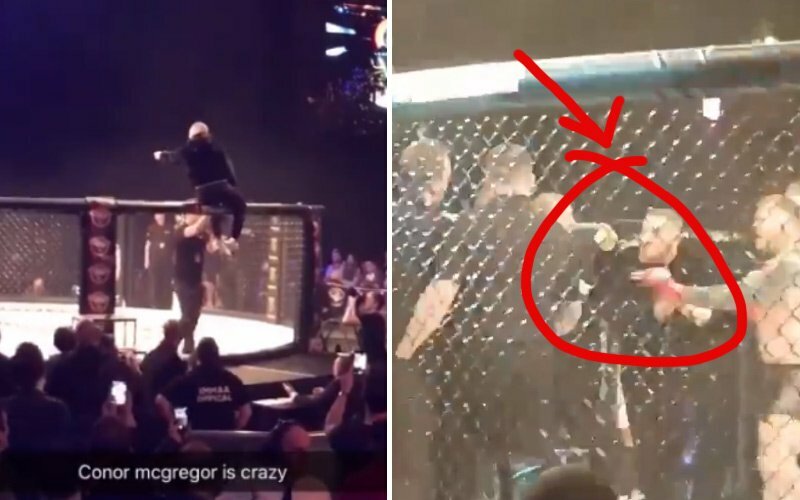 Conor jumped the cage at a Bellator event and got into with the ref, a big no-no. The UFC does have to play by Conor’s rules to a certain degree, because every other MMA promotion on earth would be eager to allow McGregor to co-promote if that’s what it took to get him fighting under their banner, or McGregor could even simply promote his own fights and cut all of the major promotions right out of it. It’s a logistical nightmare, but the money is there and things seem to have a way of working out for McGregor, besdies the occasional setback. “I’m 29 years of age and I have climbed to the very, very, very top and with…not with relative ease…I’ve put in a lot of hard work,” he said while being interviewed on “The Late Late Show”. “I’ve put in crazy amounts of hard work and most people do not see the wars upon wars in the gym just to get to the fight.